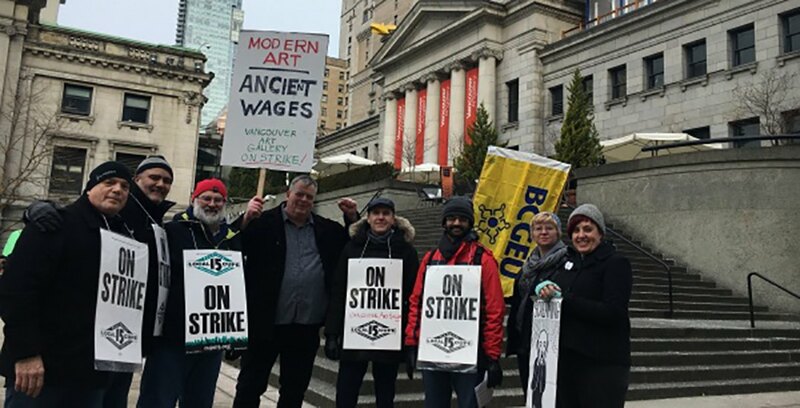 After more than 200 unionized striking workers at Vancouver Art Gallery (VAG) agreed to move ahead to mediation last week, the VAG announced on Tuesday that a new, collective agreement has been reached between the VAG and CUPE 15 – the union representing the workers. Earlier this month, the unionized workers went on strike out of what they said was frustration with the fact that “the gallery managers continue to insist on a major concession and refuse to move from their position,” according to CUPE 15 President Warren Williams. Williams had said that that managers at the gallery have been pushing for a major change to their scheduling model, that if allowed, would subject employees to two-tiered working conditions. Other issues cited by CUPE 15 included “lacklustre” wage proposals and attempts to slash workers’ sick leave. The VAG, however, told Daily Hive that there has been no such roll-back of benefits for its current team members – rather, the opposite. On Tuesday, the gallery said that now, both parties have been able to work closely together to come to an agreement that is fair and balanced, and that the new collective agreement will be retroactively applied to July 1, 2017.